Singapore might appear as a tiny dot on the map but it's quite up there with hundreds of shopping centres, and perhaps one of the most vibrant shopping hub in Asia. Here are the city's scoured best places to shop along with fantastic sights and get the most fashionable items. A list of Royal Sporting House shops in Singapore with addresses, phone numbers and opening hours. A list of La Perla shops in Singapore with addresses, phone numbers and opening hours. A list of Levi’s shops in Singapore with addresses, phone numbers and opening hours. A list of Kenzo shops in Singapore with addresses, phone numbers and opening hours. A list of Hermes shops in Singapore with addresses, phone numbers and opening hours. A list of GAP shops in Singapore with addresses, phone numbers and opening hours. A list of Givenchy shops in Singapore with addresses, phone numbers and opening hours. A list of Fendi shops in Singapore with addresses, phone numbers and opening hours. A list of Forever 21 shops in Singapore with addresses, phone numbers and opening hours. A list of ECCO Shoes shops in Singapore with addresses, phone numbers and opening hours. A list of Dior shops in Singapore with addresses, phone numbers and opening hours. A list of DKNY shops in Singapore with addresses, phone numbers and opening hours. A list of Chanel stores in Singapore including addresses, phone numbers and opening hours. A list of Burberry shops in Singapore with addresses, phone numbers and opening hours. A list of Pull and Bear shops in Singapore with addresses, phone numbers and opening hours. A list of Banana Republic shops in Singapore with addresses, phone numbers and opening hours. A list of ALDO Shoes and accessories shops in Singapore with addresses, phone numbers and opening hours. 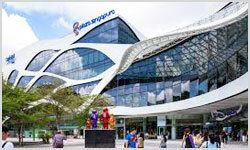 A list of GUESS shops in Singapore with addresses, phone numbers and opening hours.